After having severe pain in my left hip, my orthopedic doctor suspected a torn labrum and ordered an MRI with contrast for the hip joint. Going into the MRI I (Lisa) wasn’t sure what scared me more, the injection of the contrast into my hip joint or the actual MRI experience. When I scheduled the test, the nurse asked me if I was claustrophobic. I nervously laughed and said, "Not sure, I guess we'll find out!" I was silently freaking out about having an MRI, which you know is bad ‘cause I rarely do anything silently! Overall, the experience wasn’t horrible. The needle in my hip did hurt and the contrast dye burned as it went in and for a while afterwards. 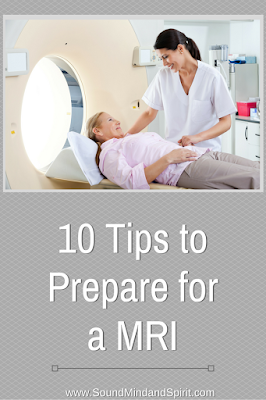 But, the anxiety of not knowing what to expect was the worst part of the MRI for me. I wish I’d read some realistic tips of what to expect rather than the well meaning horror stories I encountered on social media and the web. To be helpful, I’d thought I’d share my experience with you by offering a few realistic tips. 1. Don’t share on Facebook, Instagram or Anywhere – Seriously, don’t post on social media that you are nervous about having an MRI or that you are even having an MRI. Every one of your friends will see this as an opportunity to tell you their horror story. (Kind like moms telling pregnant women their labor and delivery stories.) Just don't do it. 2. Review the paperwork or online information for your testing location. Because I was having a contrast MRI which required a needle to be inserted into my actual hip joint guided by an x-ray my test was scheduled at a hospital located imaging center. The hospital website gave me more information about what to expect before/during/after the MRI than the one-page paper I received from the scheduling center. 3. Leave your valuables and metal items at home. Don’t even bring it. You don’t want to worry about where to put it during the test or if you remembered to take it all off. Rings, earrings, belts, barrettes, or ponytail holders… leave it at home. It's so much simpler. 5. Take a minute to lay down - Understand that you will be laying very still for a while so take a minute when you lay down to get comfortable as best you can. Lying flat on my back was a bit painful so the tech allowed me to put a small pillow under my knees to help lessen the pain. Not moving during the test was the absolute most difficult part for me. Since it was my hip, my whole body was immobile during the testing. I could open and shut and eyes, lick my lips and wiggle my fingers since they were near my head, but all I wanted was to shift or move during those 45 min. I kept reminding myself that if I moved, I’d have to start over again. 6. 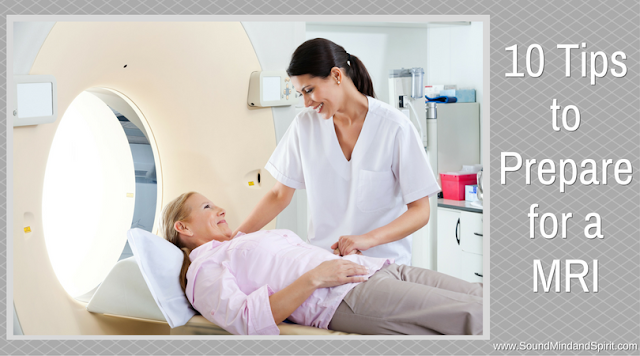 Get Comfy – I am naturally a little cold, especially when air is blowing on me like it does in the MRI machine. As I laid down, I asked to be covered in blankets because it was cold in the room and also because I find the weight of blankets comforting. The one thing I wish I’d had was chapstick. My lips were dry from the fan blowing on my face during the MRI and it drove me batty to keep licking them. 7. Listen to the noise – They gave me ear plugs, but you can still hear the super loud noises coming from the machine. I found the repetitive cycle of the noise comforting after a while. It reminded me that time was passing and we were closer to being done than we were a few minutes ago. 8. Close your eyes / Open your eyes – I received advice to not open my eyes in the machine, however, as the test got started keeping them closed freaked me out. I HAD to look around and check it out. What I was picturing in my head was way worse than it actually looked. Inspecting every inch of the inside of the MRI machine helped keep me busy. Do whatever works for you. 9. Keep your mind busy – Other advice I was given was to come up with repetitious mind games to keep myself busy. Picture a happy place, run yourself through a memory, dream of a great experience or tell yourself knock-knock jokes. I’ve had friends pray their way through a rosary or count things, like how many states you’ve visited. One friend told me he listed items related to his work alphabetically. Personally, I organized my favorite list in my head – my massive to do list. 10. Relax – You have to have the MRI test, otherwise you wouldn’t be in the machine. It’s not a harmful test. It’s just uncomfortable and long. I had a few moments in the MRI machine when the pain from my hip and the stress of not being able to move were seemingly unbearable, but I knew I had to finish the test. I DID NOT want to start over or lengthen it. It was simply uncomfortable and stressful. I forced myself to take a deep breath and relax. Once I accepted the situation and relaxed, the loud noises lulled my mind and I began to think I could fall asleep. Of course, that’s when the technician started talking to me to tell me we were almost done. How was my hip? Good news, not a labral tear. It was a torn muscle near my hip joint instead. Still painful, but easier healing and recovery. What is your experience with MRI tests? Any tips to help make it more manageable? And PLEASE, no horror stories.